Its all free!Beaches are treasure-troves,just waiting to be unlocked. Even Barking Creek and dear, muddy old Southend can provide the seeker with a wide variety of interesting objects. I once found a fossil shark's-tooth and the tiny body of a victorian china dolls'-house doll on Southend beach. She was a 'Cold Charlotte', so-called because her head and body were in one stiff piece;her arms and legs,which would have been movable,had long ago washed away. At the Natural History Museum they told me that a little boy who lived on the Isle of Sheppey had a large collection of fossil seeds; at our caravan site in Steeple Bay,where the tidal river flows through flat scenery and the 'beach' is salty mud, my daughter and I found fossil lobsters,crabs and many different fossil shark-teeth,all of the Eocene(London Clay) period. Some of the lobster fragments were of use to the Museum;I was given an excellent piece of Carboniferous bark as a swap,and they carefully placed all my fishy dental findings in little glass tubes, corked and labelled. Barking Creek provided a large collection of old china,bottles,glass and best of all,the tiny china arms and legs of victorian dolls( the bodies would have been cloth). We spent many happy hours setting the china and glass fragments into biscuit-tin lids, using Polyfilla. I still have one on my wall. It contains half a doll's head,a toothpaste jar and a little Marmite bottle,among other finds. Look for them in the picture above. Some beaches-for example those on the south-west coast- will be rich in fossil treasure,ammonites and even bones of Triassic age. The Devon sands are really red, and I made a shell-box with shells we collected there. On the lid of the cigar-box I used, I glued a shell on which I had painted a picture of the two of us (my little daughter and me), with the sea beside us and the cliffs rising behind. The box stands on 4 shell-feet,and is lined with pink silk and gold braid (very flash!) wth three little mirrors inside the lid. JET AND PILGRIMS' BADGES and ??? 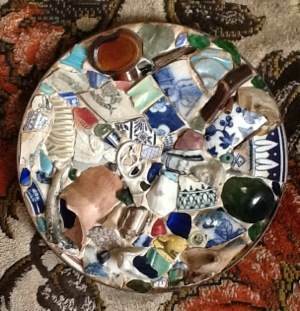 I have a large hoard of small treasures, including a blue china lion,(perhaps a teapot-knob),several sea-urchin spines,and a tin-ful of red venetian glass beads which were part of the cargo of a ship once wrecked on one of the Scilly Isles. If you are ever at Whitby, look out for jet,which is common there. If you live in London,there will be times when you can go down to the shore of the Thames. There you may find Pilgrims' badges,lost by some unwary traveller. A group of people who call themselves'Mudlarks',after the children who made their living from what they found in the river in Victorian times,search the shoreline for historical objects,and many of their finds are in our museums. This was found by a modern-day 'Mudlark'.